Center on Contemporary Art, Seattle; presented as part of In Resonance, curated for Bumbershoot by Fionn Meade and Robert Millis. 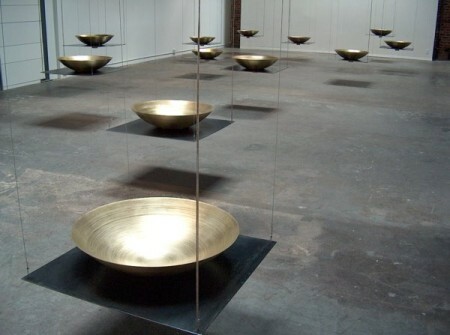 Spun brass bowls on suspended steel plates with 20 channels of audio. We invited people to contribute their wishes for change in the world and received over 300 written responses from people in fifteen countries, read by thirty-two of our friends and neighbors. All of the sound is derived from these many recorded tracks of whispering voices. Individual voices are heard through the bowls via transducers attached below. Heard clearly in the first bowl, the voices are electronically transformed into increasingly pure, abstract tones as they flow through the space in a wave and subside into silence. Random groupings of unprocessed voices are heard at low volume throughout the gallery.